Comebacks from a 3-0 deficit have been done in hockey, and in baseball, but never in the NBA. It makes sense; those first two sports put an inordinate amount of weight on one person, a goaltender or a pitcher. But basketball is ostensibly the same starting five every night—except when it's not. Houston handled the Thunder, 107-100, to make this series 3-2, and it's obvious—not that we even needed experimental evidence— just how important the absence of Russell Westbrook is. Houston's defensive strategy was simple and sound: swarm Kevin Durant. It worked, kind of. 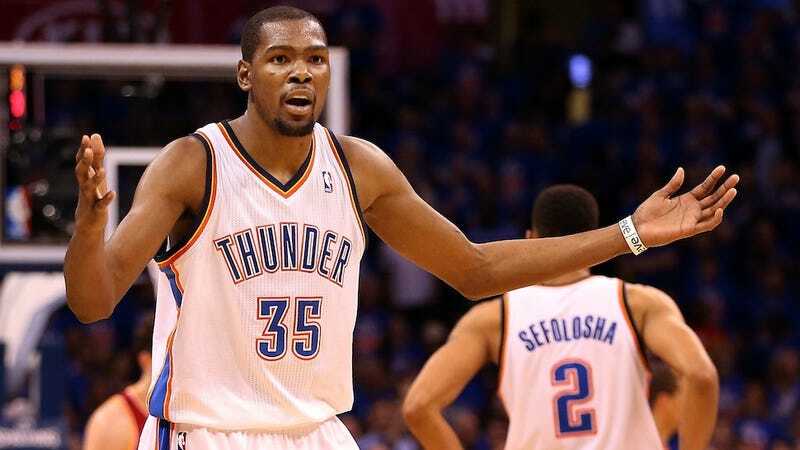 Durant's superhuman, so he was still able to score 36 points—but none in the fourth quarter. His frustrations earned him a very un-Durantlike technical. None of which should take away from the Rockets, who are showing that they just might be the more balanced team in this series. (They're also not missing their second-best player. But then, it's not clear who their second-best player is.) James Harden was lights-out, making the first seven threes he took—this despite missing the morning shoot-around with "flu-like symptoms." Houston had six players in double figures, and that's with Jeremy Lin missing his second straight with a bruised chest muscle, and Carlos Delfino exiting at halftime with a sore foot. Patrick Beverley, who the Rockets rescued from the European scrap heap in January, has filled in nicely for Lin twice now, contributing 14 points and eight rebounds last night. And then there's Omer Asik, who found himself a specific target of the Thunder's defense, even if they don't know his name. Asik finished with 21 and 11, including 13 of 18 from the line. The series shifts back to Houston, but despite the momentum, it is still technically the Rockets with their backs against the wall. Kevin Durant can do this with minimal help—he did it in Game 3, and he would have done it last night had his fourth quarter resembled the first three. He can steal one more win. The more ominous question is whether he can steal 12 more after that.